When I arrived on the 15th floor of the EMI America record company offices on Avenue of the Americas in New York, there were a couple of Red Hot Chili Peppers sprawled out, sound asleep. Anthony Kiedis, the lead singer was snoring on the couch, and Michael Balzary (“Flea”), Anthony’s good buddy and songwriting partner, was sort of in rigor mortis underneath the coffee table. I felt like I knew them already. Their publicist woke them and insisted they sit up for our interview- which they agreed to do reluctantly, after having taken the red eye from California the night before, right after three straight live gigs in places likes San Diego and Irvine, twice opening for X. The two other members of the Red Hit Chili peppers, drummer Cliff Martinez and guitarist Hillel Slovak, stayed in California. But Anthony and Flea can do enough talking for ten or twelve recording artists. Their second album, Freaky Styley, has been released and they are happier with it than they were with their critically-acclaimed first album from last year, True Men Don’t Kill Coyotes. Mr. Funkadelic, George Clinton, produced , Freaky Styley, and maybe that’s why. They are all guys in their early twenties who “formed a philosophical bond” at L.A.’s Fairfax High in the late ‘70’s. Flea, the bass player, and Anthony recall a history teacher there who enjoyed making their young lives miserable by ripping apart their idols (one of Flea’s is the write/poet Charles Bukowski) and just by being an all-round louse. Circumstances like these only drew their gang, “Los Faces,” closer together. Flea was an actor as well as a rocker before the Chili Peppers came to be. He appeared in the movie Suburbia, a gig he landed through exposure gained by joining the group Fear. But before that, things were a bit rougher: as one of his jobs was that of an attendant at a small animal morgue. He can tell you all about the science of cat and dog extermination- first they freeze them, then incinerate them. Not a pleasant business, Flea admits, but somebody has got to do it. 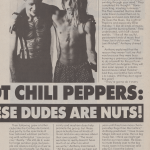 A couple of years ago, on the strength of one poem that Anthony came up with and a bass line that Flea worked out, the Chili Peppers were born. They performed at a club called the Rhythm Lounge and they immediately caught on. “We weren’t rehearsed, we just went out and did it, and in a couple of weeks we were the hottest thing in Hollywood,” Flea said. “It took us about three shows to get on top of the scene there,” Anthony added. Their following grew at other clubs like the Cathay de Grand, due partly to the spectacle of four tattooed wildmen performing with nothing but “sox on cox.” Really. “We still do it, even for large outdoor gigs, but people are still asking us if we are gonna ‘do it tonight,’ so the novelty has worn off a little,” Anthony explained. Speaking of tattoos, Flea has a great one of Jimi Hendrix, another idol, living on his left shoulder. It is a fine piece of work. “Our live performances are pretty much in a class by themselves,” Flea contended.”It’s a whirlwind of spontaneous anarchy. Locked in with a comic, hard-core soul groove.” Anthony nodded agreement. “Kind of like anarchic, psychedelic tornadoes swirling through your mind,” Flea completed his thought: “Bone-crunching, mauling funkiness.” The Flea revealed that his older sister Karen turned them onto reggae and even Joni Mitchell. He loves the blues, like Lightnin’ Hopkins and especially Billie Holiday. “I like all kinds of music, if it’s got the burning flame.” Flea understated, with half-closed eyelids. “I like all the soulful, passionate kinds of music that I hear, be it old or new,” “I like Joni Mitchell,” Anthony chimed in. Anthony explained that the reason they weren’t at Live-Aid was because they were too busy honouring a previous commitment to do a benefit for the pot farmers of East Los Angeles. They will also soon appear in a skate-board movie called Thrashin’. And they are faithful fans of the L.A. Lakers. Will they do it again this year? “We’re an L.A. band and proud of it,” Flea stated.